Nowadays, if you go to the book stores in Kobe, you’ll see at least one sightseeing guide book about Sasayama city. The picture is a corner of Group of merchant houses of Kawaramachi which is especially getting crowded with sightseer lately. 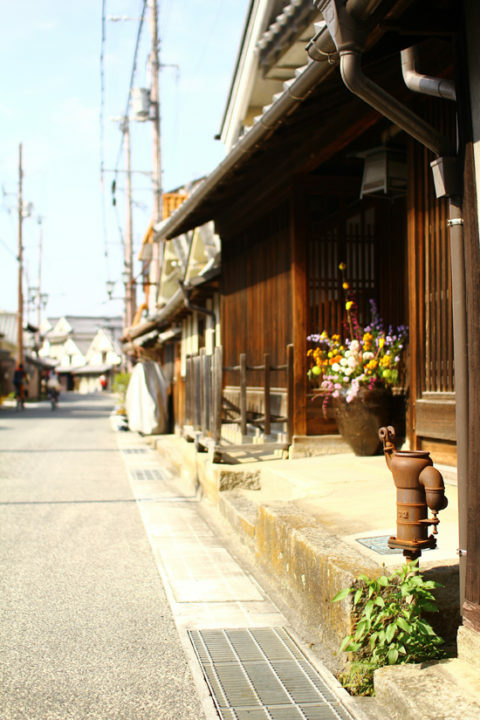 Those old hosues are from Edo period and some of them are renovated to Cafe and shops. New shops opened or houses under renovation, the street shows some changes every time we visit here. Even private residence arranges some flowers like this and give joy to the street. The street may be yet bit deserted to say “The street is full of people”, but these changes will bring people little by little and makes crowd of people in the end. Wish these changes continue and hope we will be able to do something to help it. Photo: A corner of Group of merchant houses of Kawaramachi, Sasayama.